This is one of the best moments for us in our company for the year 2012! We are elated and proud to have received the Asia Pacific Most Prestigious International Brand Certification- “Asia Pacific Top Excellent Brand Award”. We owe the achievement to the continuing support of our esteemed customers with whom we owe our profound gratitude and sincere thanks. 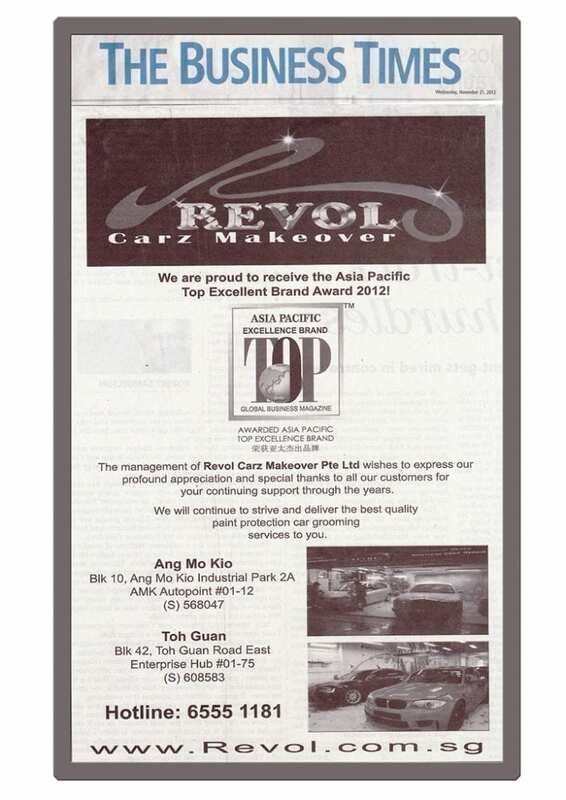 The management shares the award with our dedicated Revol Carz Makeover team and acknowledge, with special thanks, their commitment and sacrifices through the years. This award sets another important milestone and recognition for our company. It certainly drives our determination even more to commit delivering higher standard and even better car grooming quality service to every customer. Stay tuned as we breeze through year 2012 with more great news coming up.